Pottery or stoneware, relief, 0.5L, inlaid or pewter lid. 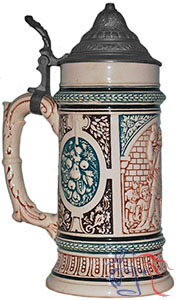 Gambrinus, “the king of beer”, has long been a universal symbol of beer and brewing. It has been suggested that the character may be drawn from the claimed real-life inventor of hopped malt beer, Jan Primus (Johann I), a 13th-century Belgian Duke and President of the Brussels Guild of Brewers.